Renewal? You Can Grow That! We all love flowers and color, and in some ways the blossoms and hues that appear in the spring are the most appreciated. 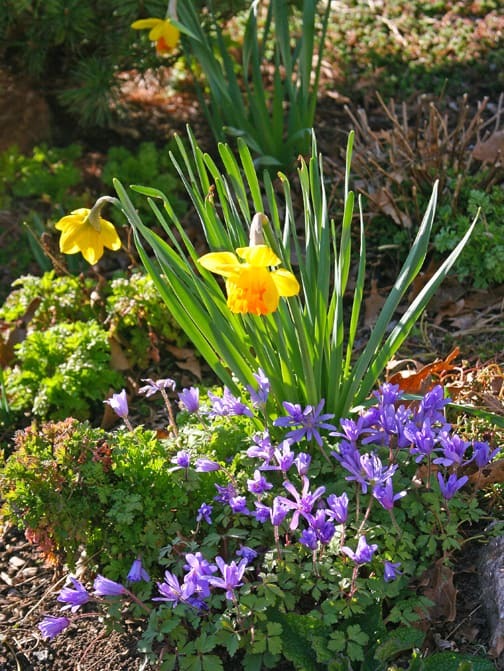 Every garden should contain some bulbs, shrubs and perennials that are colorful as winter ends and the growing season begins.Consider, however, that your spring garden offers more than early-season flowers. Throughout the world, spring is associated with rebirth. It is the season that marks growth and renewal. When we put spring-flowering plants in our landscapes, we’re participating in this global celebration of regeneration and progress. There are, I propose, very deep reasons why spring flowers lift our spirits. Yes, we love the colors. Agreed, we’re happy that winter is over. But beyond all of that, our hearts and souls rejoice because we are reminded that growth, in all aspects of our lives, is not only possible but inevitable. Join in the celebration: plant for spring color. It's Garden Bloggers You Can Grow That! Day and I'm hear to say you can cultivate renewal.